Can behavior genetics reveal the structure of ethanol-related behavior? Alcoholism – A neural disconnection syndrome? Are alcoholism-related increases in functional activity and connectivity compensatory? Familial predisposition for alcoholism effects on sleep? What is the evidence that sbirt works? Researchers and graduate students in neuroscience and neurology with an interest in addiction science, and clinical neurologists. Edith V. Sullivan is Professor of Psychiatry and Behavioral Sciences at Stanford University School of Medicine. She received her B.A., M.A., and Ph.D. in experimental psychology from the University of Connecticut. Following graduate school, she was a research scientist in the Department of Brain and Cognitive Sciences at the Massachusetts Institute of Technology (MIT) and the Ashton Graybiel Spatial Orientation Laboratory at Brandeis University. As a neuropsychologist with expertise in neuroimaging, Dr. Sullivan has championed putting the "neuro" into neuropsychology and has done so in her research and through her editorship of Neuropsychology Review. Her research combines quantitative brain imaging and assessment of component processes of neuropsychological functions to the study of neuropsychiatric diseases and normal function over the life span. Dr. Sullivan's interest in brain related conditions grew out of her experience as a researcher at MIT in the late 1970s to mid-1980s. There, she had the opportunity to work with the famous amnesic patient, H.M. Inspired by the component processes approach used in lesion research, she has applied these concepts to dissect impairments in cognitive and motor function in patients without focal lesions. Her early work focused on Parkinson’s disease, Alzheimer’s disease, and schizophrenia. Over the last two decades, the mainstay of her research has been on both normal aging and alcoholism-related brain injury in human nonamnesic and amnesic alcoholism and animal models of excessive alcohol exposure. Her research has resulted in identification of brain circuitry disrupted in alcoholism and elucidation of spared circuits that have the potential to enable functional recovery with sobriety. Dr. Sullivan is the author of more than 250 peer-reviewed papers and numerous chapters and reviews. She serves on the editorial board of Alcoholism: Clinical and Experimental Research, Brain Imaging and Behavior, Hippocampus, Frontiers of Neuroscience, and Neurobiology of Aging. She is the recipient of several NIH funding awards, including the Senior Scientist Research and Mentorship Award, a grant for international collaborations on alcoholism research, and an NIAAA MERIT award for studies of neural circuitry modification in alcoholism focused on frontocerebellar systems. She also received the NIAAA Keller Award. Adolf Pfefferbaum is Distinguished Scientist and founding Director of the Neuroscience Program of SRI International and Professor Emeritus, Stanford University School of Medicine. He received his M.D. from the University of California, San Francisco, completed Internship in Medicine at Barnes Hospital in St. Louis, was Research Associate at the NIH, and did Residency training at Stanford. For nearly 40 years, Dr. Pfefferbaum has combined medical clinical skills with scientific rigor and creativity to develop and apply electrophysiology and neuroimaging approaches for identifying in vivo brain markers of the effects of long-term, alcohol dependence. His longitudinal neuroimaging studies using quantitative magnetic resonance imaging (MRI) have revealed alcoholism's scope and limits of recovery of brain structure and function. With diffusion tensor imaging to quantify the microstructure of white matter, Dr. Pfefferbaum has shown fiber degradation in alcoholic men that related to memory and attention; in alcoholic women, fiber compromise occurs in normal-appearing white matter. His seminal contribution using functional MRI revealed that alcoholics recruit broader areas of brain than controls to perform at equivalent levels on working memory tasks. In addition to naturalistic studies of human alcoholism, Dr. Pfefferbaum has an active research program using rodent models of alcoholism, employing macrostructural, microstructural, and functional imaging enabling translational research. Dr. Pfefferbaum has been the principal investigator on numerous NIH-funded grants, including a Merit Award from the National Institute on Alcohol Abuse and Alcoholism (NIAAA). He has also served the NIAAA as a member and chair of the Alcohol Biomedical Research Review Committee and of the Center Reviews and Special Emphasis Panels. Most recently, he was named a member of the NIAAA National Advisory Council. Dr. Pfefferbaum is a member of a number of scientific societies and is a fellow of the American College of Neuropsychopharmacology. 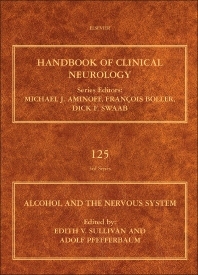 He is on the editorial board of Alcoholism: Clinical and Experimental Research, Psychiatry Research, and was co-editor of Psychiatry Research: Neuroimaging for many years. He has published more than 350 peer-reviewed papers and 50 chapters and reviews. His many honors include Phi Beta Kappa, Phi Kappa Phi, and Alpha Omega Alpha. In recognition of his innovative work in electrophysiology, the American Psychiatric Electrophysiology Association presented him with a Career Contribution Award. His scientific contributions to our understanding of alcoholism have been acknowledged through reception of the Keller Award from the NIAAA and the Begleiter Award for Research Excellence from the Research Society on Alcoholism.